Washington, DC--U.S. District Court Judge Richard J. Leon ruled today that the government NSA domestic telephone spying program was a violation of our rights under the Fourth Amendment of the Constitution. On June 5, 2013, UK publication, The Guardian dropped the Edward Snowden bombshell that our NSA and various telecommunication companies had a domestic spy program in place collecting our telephone conversations and other data. This was without the pre-requisite search warrants or even minimal probable cause. Government snoops can simply access any of our past calls and listen in at will! The group Judicial Watch and others, including Larry Klayman filed suit against Barack Obama in the D.C. U.S. District Court seeking an injunction halting the outlaw behavior. The Obama Administration claimed this lawless program was necessary to thwart terrorism but the government could not cite a single event where a terrorist act was interrupted because of the program. Snowden told anyone who’d listen that this was really for gathering intelligence information against political enemies and others targeted by the Obama Administration. Discovery and abuse of any illicit sexual or criminal activity by would definitely be used nefariously to sway Congressional votes, judicial decisions and control those who may or may not run for public office. Could this be the cause of Supreme Court Justice John Roberts to make a surprise ruling on Obamacare? We now have government by extortion and blackmail. Imagine the shameful FBI COINTELPRO program today with this advanced technology! This is COINTELPRO on steroids! This phone snooping program was and is Orwellian and criminal. Anyone connected to this should be tried as common criminals. Disgraced former Hollywood private investigator Anthony Pellicano has been rotting in prison for the same behavior for nearly a decade and it will be several more years before he will be considered for release. Our politicians and bureaucrats have no special legal immunity and those involved should be brought to justice for their crimes regardless of political party affiliation. Judge Leon found the program was a violation of American’s rights and issued an injunction but stayed it subject to appeal. This should set the stage for the Impeachment of Barack Obama and criminal prosecution for all of those involved. Our freedom is much safer tonight because of Edward Snowden who left a lucrative job, risked his freedom and life exposing this tyranny. We owe Snowden a lot for what he did. To suggest that lives were jeopardized by Snowden’s leaks is outrageous. Every American is endangered by the Obama Administration's criminal conduct. Our job as American citizens is to now take whatever action is necessary to take charge of or nation and bring these political and government thugs to justice. It may well take more than lip service but the force our founders gave us the right to use under the Second Amendment. 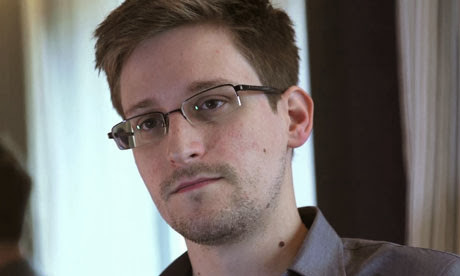 Edward Snowden is deserving of our nations highest award for bravery. especially your article today on Snowden. This is the vilest president the Country has ever had, and will go down in history as a Traitor ! I am glad that Edward Snowden will eventually be seen as a hero. I have always supported his bravery to reveal this surveillance society. I hope Snowden will get some peace eventually and some honor. Like Nelson Mandela did - and I hope it won't take as long! It seems human beings are so stupid they will slowly let those more powerful tread on their toes, until it becomes a massacre or a 1984 situation with no rights whatsoever and no freedom. It does not matter whether it is Royalty at the helm or Consortium of the Corrupt. I am sick of the surveillance society. I can't even look at my email without some advertisement designed to spook a person out. Big Brother is watching and spooking you out accordingly. Plus apart from Big Brother - People so rude they stick their LOUD private telephone conversations in our faces, conduction business from the ladies or mens room and expect us to REMAIN SILENT while we listen to this sh..